Welcome to Movie Madness Monday, the movie quote trivia game. This week's feature starts off with a sly reference to popular culture that was a complete surprise. I love this DVD-- it's "precious" to me. This is an easy one. So put your quotes in the comments section! "Oh come on, we can take 'em!" "I cannot jump the distance; you'll have to toss me." Pause. "Don't tell the elf." "I know. It's all wrong. By rights we shouldn't even be here. But we are. It's like in the great stories. The ones that really mattered. Full of darkness and danger, they were. And sometimes you didn't want to know the end. Because how could the end be happy? How could the world go back to the way it was when so much bad had happened? But in the end, it's only a passing thing, this shadow. Even darkness must pass. A new day will come. And when the sun shines it will shine out the clearer. Those were the stories that stayed with you. That meant something, even if you were too small to understand why." "There is no promise you can make that I can trust." "Looks like meat's back on the menu, boys!" "What do trees have to talk about, hmm... except the consistency of squirrel droppings?" "Shall I describe it to you?" "Or would you like me to find you a box?" The Lord of the Rings: The Two Towers! Viggo Mortenson. Orlando Bloom. Cate Blanchett. Sean Astin. Hugo Weaving. Karl Urban. John Rhys-Davies. Miranda Otto. And Elijah Wood! And can Christopher Lee ever play anything but a baddie? Go read the books today! Lord of the Rings, of course. The Two Towers, I think. "Well, that's an eye-opener, and no mistake." "Fool of a Took! Throw yourself in next time and have done with you." 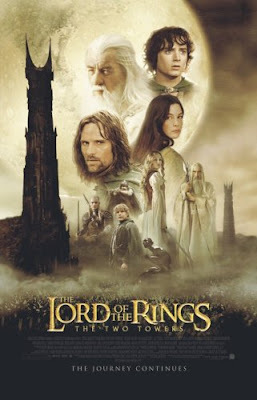 Such a great movie, "My precioussssssssssssss..."
And I just love the sense of resignation with which Boromir says, "They have a cave troll..."
"What we need is a few good taters." "It's true you don't see many dwarf women. And in fact, they are so alike in voice and appearance, that they are often mistaken for dwarf men." "Keep your forked tongue behind your teeth. I did not pass through fire and death to bandy crooked words with a witless worm." "We are hobbits of the Shire. Frodo Baggins is my name, and this is Samwise Gamgee." "Three hundred lives of men I have walked this earth, and now I have no time!" "Just a bit of seasoning. I thought maybe if we was having a roast chicken one night or something..."
(in a heart-broken whisper) "How did it come to this?" (desperately) "What would you have me do?!" "Now for wrath, now for ruin, and a red dawn!" "At dawn, on the fifth day, look to the east." LOTR - Return of the King, I think.